Tocqueville pessimistically predicted that liberty and equality would be incompatible ideas. Robert Dahl, author of the classic A Preface to Democratic Theory, explores this alleged conflict, particularly in modern American society where differences in ownership and control of corporate enterprises create inequalities in resources among Americans that in turn generate inequality among them as citizens. 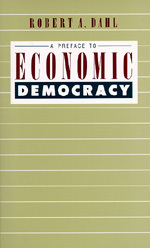 Arguing that Americans have misconceived the relation between democracy, private property, and the economic order, the author contends that we can achieve a society of real democracy and political equality without sacrificing liberty by extending democratic principles into the economic order. Although enterprise control by workers violates many conventional political and ideological assumptions of corporate capitalism as well as of state socialism. Dahl presents an empirically informed and philosophically acute defense of "workplace democracy." He argues, in the light of experiences here and abroad, that an economic system of worker-owned and worker-controlled enterprises could provide a much better foundation for democracy, political equality, and liberty than does our present system of corporate capitalism. 1. Is Equality Inimical to Liberty?